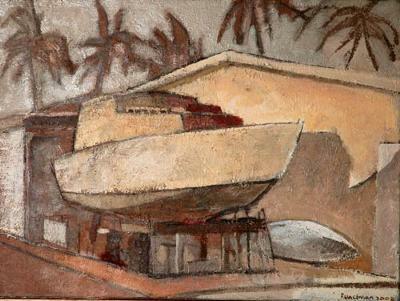 Mary Ann Runciman was born in Tanzania, where she studied painting and art history at the University of Natal. She emigrated to Australia where painting and printmaking courses in Adelaide followed as well as some years spent in Paris, where she studied anatomy and drawing. She uses charcoal and conte for her drawings and preliminary sketches for oil paintings of people, boats and places. Always interested in the human figure her life drawing years developed into semi-abstract oil paintings, the "Confinement" series. Mary Ann divides her time between studios in Adelaide in South Australia, Port Douglas in Queensland and in Paris, France. It's scraped down underpainted colours in the late afternoon light captured me. I didn't know it was George's, given to him after his own boat disastrously burned. It was a painting that ran sweetly from start to finish. Love your boats Mary Ann, George's boat, Troy's boat, and Jolly Cat. We have lots of power boats in Chicago's harbors in Lake Michigan. And many sail boats. Remember Chicago is called the windy city, but it is not the natural winds, but their politicians winds that gave the nick name to Chicago. Give a look at Jill's posting of "Chicago Lighthouse", "a sailors life", and "lighthouse paintings 1". Now you have given me a challenge to paint a day cruiser and some power boats. You have done a beautiful job with your boats. "Jolly Cat" caught me with it's colours and the geometry of its lines. 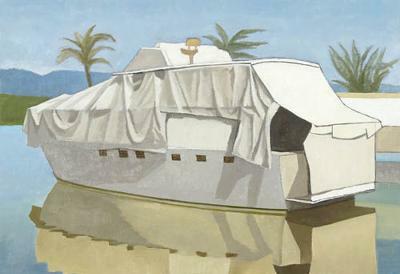 All the boat paintings were done from "life", with no reference to photographs. Getting access to the slipway and fisherman's lease is a good part of working in Port Douglas, not available in bigger places. A major consideration in choosing a subject is whether there is a good vantage point, very preferably with shade and will the subject be there for a time. All this to reduce the discomfort and degree of difficulty to better concentrate on the work. Light and time of day are to be chosen with care. Therefore many visits to the site on reconnaissance are good. As boats are moved about frequently on the slipway I chose the more static ones that seemed to be staying put. Cirrio, Malachi and George's boat are all now in the water. With a more ephemeral subject a sketch beginning and photo are insurance against a move. 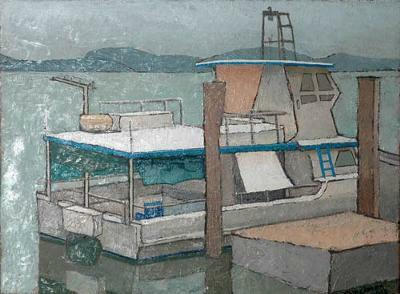 I like painting the boats with the hulls out of water, the most descriptive part of them. "Troy's boat" is the most poetic of them with it's scarves and pretty swelling belly. The boats out of water, above the ground seem to be about to sail across the sky and the people living on them are surely free spirited. I painted this on the slipway/boat workyard. 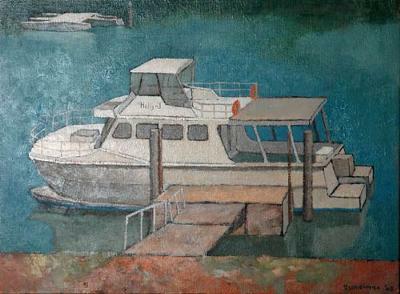 My first boat painting in Port Douglas. I started in the shade of a big boat beside me but this was moved so the next session was in full sun - hard! When I am in Port Douglas I go painting and sketching at the inlet most mornings before the boats leave for their day at the Great Barrier Reef. This Painting was done from the M.A.D. office upstairs at the marina. Found someone with a love of the sea as much as I do. 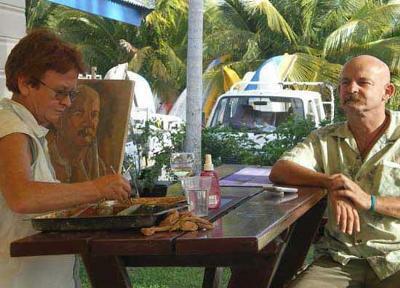 You have a realism seldom seen in sea side paintings. Then scroll down to "a-sailors-life"
and also look at "chicago-lighthouse"
People accuse me of having water on the brain. Love your depiction of "a day's fishing". Would like to see more of your works.